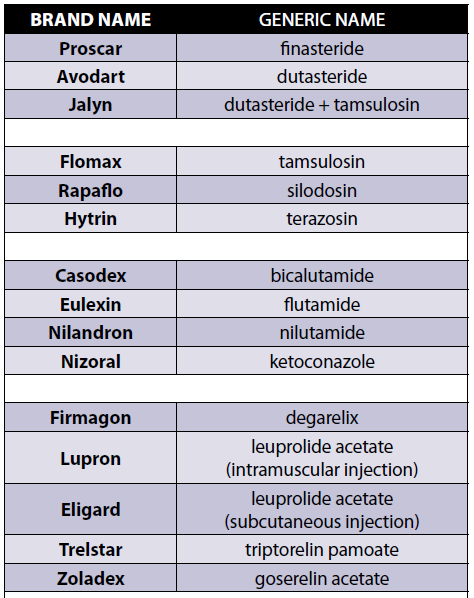 Every Drug has 2 names. From antibiotics to chemotherapy, every drug has a brand name and a generic name. For the patient, this can be confusing, especially when trying to research a treatment, which is essential in developing better questions, and essential in Shared-Decision Making with physicians. If we are going to ‘share the decision,’ we must share the language and share the information. Sometimes this is harder than it should be for the patient or caregiver. 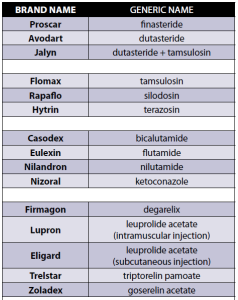 The table to the right is a tool you can use to help recognize both names of a treatment or drug as you are doing research, whether it is on the internet, or at a medical library. 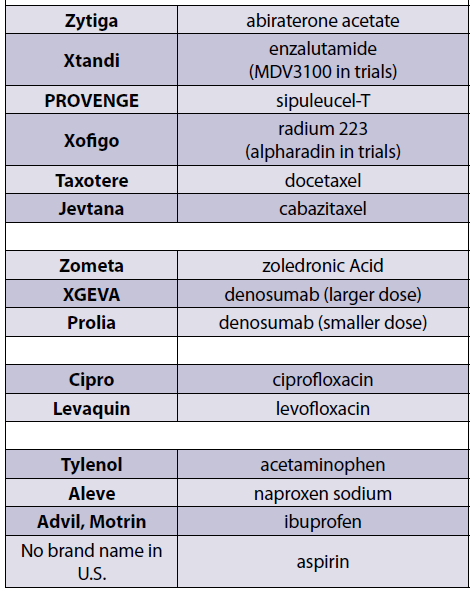 This list is not all-inclusive, but hopefully illustrates an important issue in your cancer research, which is that every drug has 2 names, and even a third name in its earlier clinical trial days. So don’t let this confuse you – look to recognize both names, the generic name and the brand name. Don’t be discouraged if you ‘Google’ one name, and find the other. As always, continue to research your ideas and questions before you ask your physician(s). A researched question is a better question. And a better question always gets you a better answer. 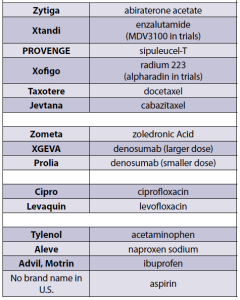 FOR SOME EXAMPLES OF TREATMENTS & DRUGS OFTEN USED IN BPH & PROSTATE CANCER PLEASE SEE THE CHART BELOW. Look for other upcoming articles on Clarifying Concepts to help patients and caregivers in their research, formulation of questions and Shared Decision Making with their physicians.